It’s wonderfully easy to see the three cultural touch points that inspired Hong Kong Massacre; Hotline Miami, Max Payne and the Hong Kong action films of the 1980’s and 1990’s. 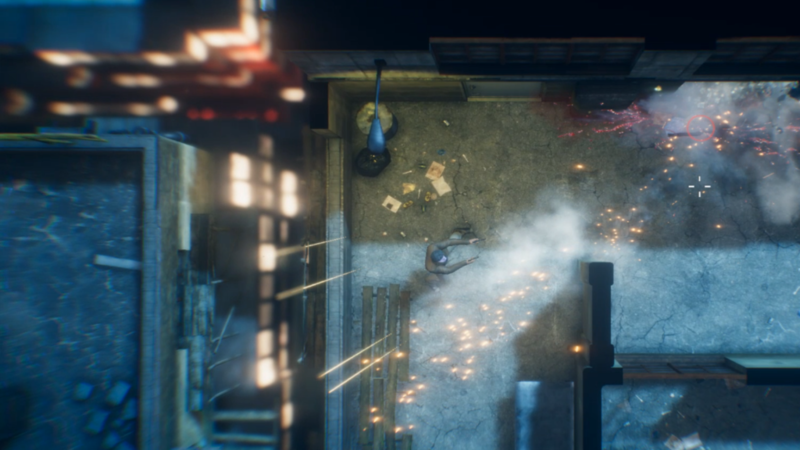 From a top down perspective you must guide our former police officer ‘hero’ through 35 odd levels of bullet hell chaos with the goal of taking vengeance for…well to be honest I got completely lost with the plot. The story is drip fed through minimalist cut scenes that, whilst admittedly looking cool and are well lit and directed, don’t really explain the plot to any great level. On top of the cut scenes you also a treated to a non-linear time hop between conversations with a childhood friend barman and your former colleague in the police force. Each do an ok job at explaining what the next level will be but at no point did I really know why I was seeking vengeance against the triad, at first there was a cutscene where I presumed my girlfriend was shot down but then a character part way through the game talks about a childhood friend of the pair having been in the wrong place at the wrong time and been killed at a drug deal. All in all the story is not what you should be here for, it’s a wrapper to justify one level being in a casino and the next being on a rooftop. 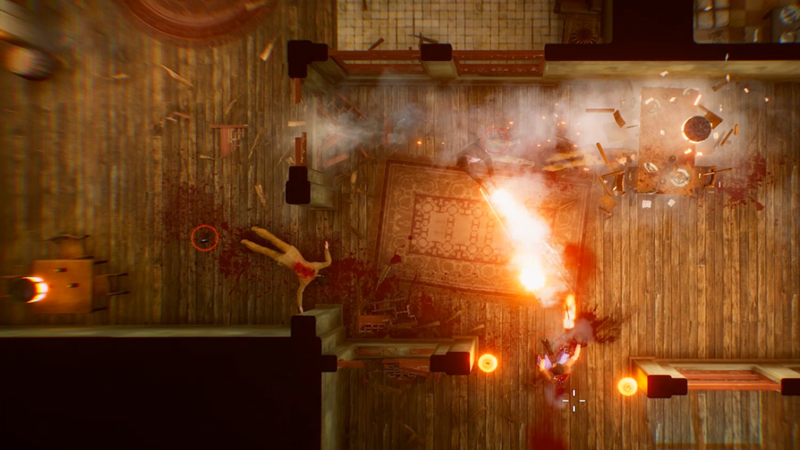 Mechanically the game plays incredibly similar to Hotline Miami, from your vertical view you must navigate levels ,with a more often than not trial and error approach, to find the rough locations of the enemies dotted around. One bullet kills an enemy but the same is true of you, as such any time you’ve completed a level it’ll be down to a perfect run. I say rough locations of enemies as going from one restart to another you’ll find that some will have moved a good 10 feet or so in any direction meaning you can’t shoot off screen to where you know they’ve been each run or overly rely on muscle memory to get through. 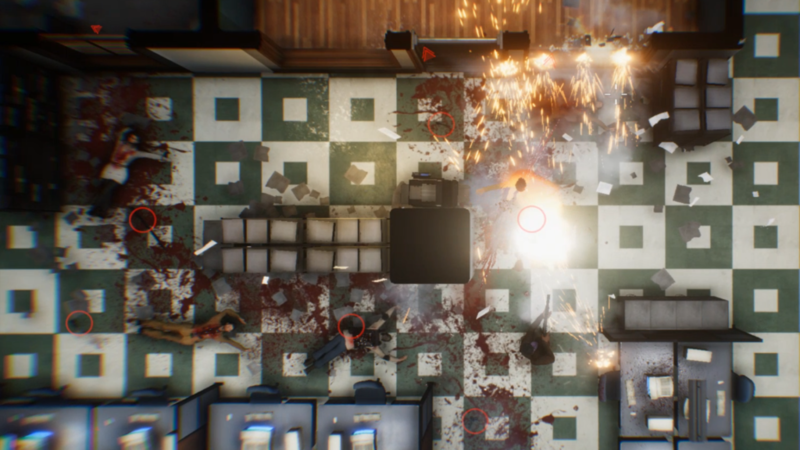 To help you survive your run and gun with twin stick shooter controls you have two other key mechanics at play, the first is a Max Payne style bullet time. The world around you, and all bullets slow to a crawl for a few seconds at a time before returning to normal chaotic speed. A bar depletes as you hold down the slow-mo button leading you to need to conserve a little meter just in case you have an unexpected shot sent your way. All of this leads to the movie style ‘going past a door spraying lead everywhere before hiding on the other side’ whilst waiting for the bar to refill. Thankfully this is an incredibly quick process. The other feature to help you survive is a dodge button that makes you invulnerable during the length of the dodge, normally this works incredibly well when it wants to, but I found more often than not I was killed during the standing up animation of a dive, and this is where the game caused more than a little frustration for me. During my gameplay I found that my deaths were rarely caused by elements I would call ‘fair’. It would be a dive ending sooner than the animation would imply and my invulnerability running out or alternatively I would just randomly die. It’s been said in many films and TV shows that “you never see the bullet that kills you” and that is essentially the mantra of Hong Kong Massacre. Whilst usually the game highlights the bullets with yellow blips followed by a long streak, it’s quite often the case that general flashes and other particle elements on the screen just seem to either hide or distract from these bullets leading to the quick end of your run. A great aspect of Hotline Miami was how quickly you could get back into the game once dead, a near instant to a button press and you’re at the start. Unfortunately Hong Kong Massacre’s refresh takes longer, I’m not going to pretend it even takes more than 3 seconds, an incredibly quick time most would agree, but when death is a single bullet away and on my worst level I died just shy of 30 times you can imagine the staring at the word ‘dead’ on my screen quickly started to grate whilst waiting for my next go to load. It’s easy to read this review so far as a bit negative, but it’s worth noting that once I finished the game I went back and tried to get top of the score boards for finishes, on the first level I was number 1 in the world (I’ll admit this was pre-release so it was only other reviewers who were playing), I then went back and had the number 1 clear time on about 5 levels in the end. I then started working on the challenges on each level, challenges like 100% accuracy or no slow-mo. These challenges earned me stars which I could use to upgrade my 4 weapons choices, pistol, UZI, shotgun or rifle. 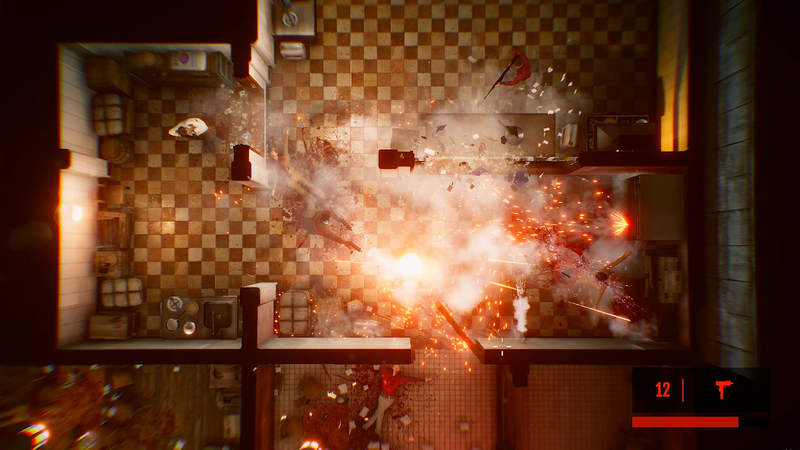 So despite getting really quite angry during my time with Hong Kong Massacre I also actively want to keep playing it after review, I’ll be thinking about it for a while and I can honestly say that this is an awesome game. Much like the classic Max Payne there’s something cathartic and fun about just holding a couple of pistols and diving through a door whilst spewing out ammo at an ungodly rate, pieces of paper fly above you and sparks litter the screen, everything in this game is there purely to make you feel like Chow Yun-Fat in a John Woo film. The story is lacking and sometimes the game can be a little unfair but even with those in consideration it’s hard not to feel like an MLG Pro for completing any level, you’re always a badass and simply put, this game is a great endorphin pumping experience.